Using this guide and online toolkit, a diverse range of people can equip themselves to effectively participate in shaping the vision and plan for their community around maintaining groundwater supplies. While technical expertise is a critical element of developing a successful groundwater sustainability plan, the community, with clarity around its values and goals, must lead the way. Community members and other interested people are needed to actively participate in groundwater sustainability planning. The law specifically calls for the engagement of diverse voices, and your involvement will help produce the strongest plan. This guide explains what’s at stake, shows you several entry points into the process, and suggests important questions to ask your Groundwater Sustainability Agency board members, technical experts, and others as you work toward a groundwater sustainability plan rooted in your community’s values. For Groundwater Sustainability Agency board members and advisory committee members, this document offers guidance for designing groundwater sustainability plans with community participation in mind. 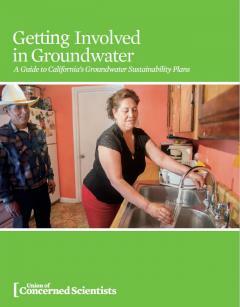 Since individual groundwater basins have different needs, this guide does not aim to be a comprehensive manual. Rather, it provides some critical questions to ask other advisory committee members and board members, stakeholders, and the technical experts with whom you’ll likely be collaborating. This guide can also help scientists, technical experts and consultants understand the interplay between technical information, community values, and perceived problems and/or benefits that will guide the definition of sustainability in a groundwater sustainability plan.